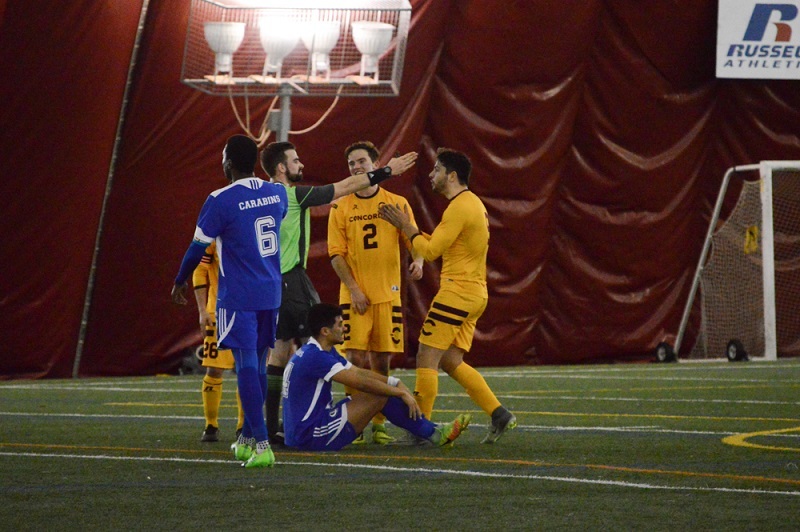 After playing in the Réseau du sport étudiant du Québec (RSEQ) fall season, the Concordia Stingers soccer teams returned to the pitch for the winter season. The teams use the winter season for training, and even though they play seven games against teams in their league, results aren’t a priority for head coaches Jorge Sanchez and Greg Sutton. The Concordian talked to each coach about how they use the winter season to prepare their team for the fall. The women’s team missed the playoffs by two points in the fall season, finishing in sixth place out of eight teams with a 3-7-4 record. Head coach Jorge Sanchez has the luxury of keeping almost his entire team intact for next season, as only graduating midfielder Alice Grandpierre is certain to leave the team. Madeleine McKenzie prepares to throw the ball in during a game on Feb. 4. Photo by Mackenzie Lad. Sanchez noted that, even though the winter season is used to prepare for the fall season, he still wants his players to focus on staying competitive by winning. “Part of the culture at this level is being part of a winning team, and you want to do that by winning games,” he said. Despite frigid temperatures and a constant reminder that it’s not typical soccer weather outside, Sanchez said players know they need to commit to the Stingers in the winter as much as they do in the fall season. The men’s team finished in sixth place out of seven teams in the RSEQ with a 3-8-1 record. In November, Sutton told The Concordian the season was marred by injuries, and there wasn’t enough experience on the team to replace the injured players. In the winter league, he’s looking to play some younger players and players who didn’t compete as much during the fall season. During the team’s first three winter games, Sutton said forwards Simon Malaborsa, who led the team in scoring last fall with six goals in 12 matches, and Peter Campbell, who had two goals, have impressed him the most. “When you have guys who come from the fall and they had a good season, you expect them to do that in the winter, and those two guys have done that,” Sutton said. The Stingers also have two players on their winter team who didn’t play in the fall. According to Sutton, twins Andres and Martin Lopez had to sit out the season after transferring from the United States, but they will be playing next fall. So far this season, the men have a 3-0 record, and the women are 2-1. Their next games are on Feb. 11 at the Stingers Dome against McGill. Main photo by Mackenzie Lad. Video by Matthew Coyte and Antoine Heuillard.